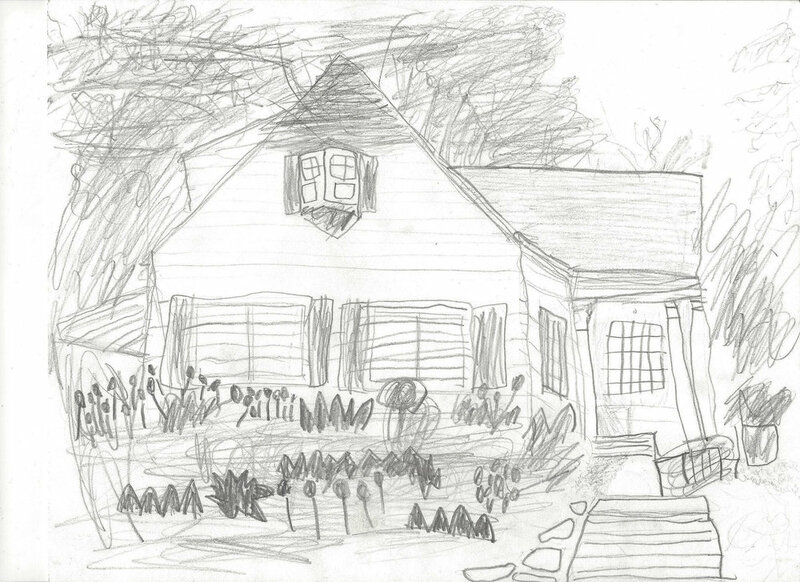 Photography by Norman Hersom · Drawing by Cedrick Patla, 1st grader. The tiny white dress – slightly beige with age – hanging in the dining area, is your first clue. Passed down from generation to generation, handled with loving care and honored with a photographic tribute to all the babies who have worn it; this dress represents what this home is all about…family and genuine hospitality. Marylu is learning how to paint using water colors. Her mother’s painting kit sits in the project room upstairs, next to a few fresh renderings. In the office, the green wingback chair she fell asleep in as a child waiting for Santa Claus waits for a grandchild to do the same. The holidays are important to the Grays, who love to have their children and grandchildren visit. Together, they look forward to every snowflake that falls. The Gray home is ideally situated on Eastmoreland’s beloved winter sledding hill and traditional community gathering spot – the Henry Street Hill. “It has been an incredible place to live. It feels like you’re living in a movie when it snows.” The Gray’s have helped bring a new tradition to the hill – a snow man contest. But even when it’s cold enough to snow, the Gray’s know how to bring warmth to their friends and family with an outdoor foot spa and gathering spot. A hot cup of cocoa, a warm and bubbly foot spa, and great company take the chill out of winter. Artist rendering by Cedrick Patla, 1st grader.